Home > Events > Keeping Invasive Mussels out of B.C. Keeping Invasive Mussels out of B.C. VICTORIA – Columbia Basin Trust is helping the province to double the number of mobile decontamination units aimed at stopping invasive mussels from entering British Columbia waterways, thanks to $360,000 in new funding. This new partnership, in the Ministry of Environment led Invasive Mussel Defence Program, also includes support from Columbia Power Corporation, FortisBC and the four local invasive species councils operating in the region East Kootenay Invasive Plant Council, Central Kootenay Invasive Species Society, Columbia Shuswap Invasive Species Society and the Northwest Invasive Plant Council. The new resources mean an additional three mobile inspection and decontamination crews will be dedicated to stopping and ensuring boats are free of mussels. The teams will be based in Cranbrook, Valemount and Nelson, to target major entry points from Alberta and the U.S. The new teams join three other crews that are already operational, doubling the number of mobile units dedicated to protecting B.C.s lakes and rivers against the threat of quagga and zebra mussels. 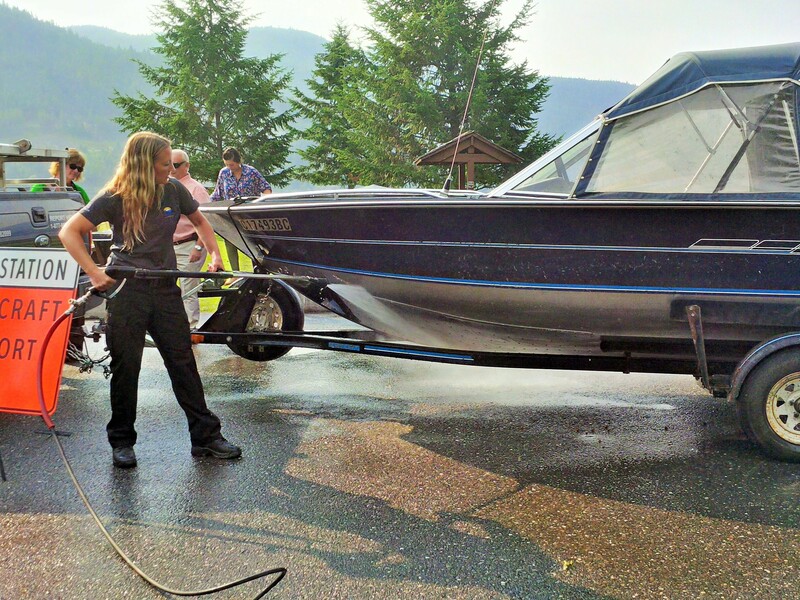 The decontamination units allow auxiliary conservation officers, who are trained to identify mussel-infested boats, to decontaminate boats and trailers entering B.C. The teams also respond to boats identified as concerns by the Canada Border Services Agency, and partner agencies in Alberta and the U.S. The mobile units move between border locations, focusing on high-traffic routes and have the ability to quickly respond to any reports of potential threats called in through the provincial Report All Poachers and Polluters line. The addition of these specialized mussel detection teams further enhances the provincial early detection and rapid response program for invasive mussels. This includes supporting education and outreach activities, such as the Clean, Drain, Dry program being delivered by the invasive species councils. Aquatic invasive species, such as zebra and quagga mussels, pose a significant threat to Canada’s freshwater ecosystems and critical infrastructure such as hydroelectric and drinking water facilities. No zebra or quagga mussels have ever been found in B.C. waterways, and the Province is hard at work ensuring it stays that way. bugensis) are not native to B.C. · Both of these species originate from Europe. They were introduced to Canada (in the Great Lakes region) and the United States in the 1980s, as the result of ballast water being discharged by vessels travelling from Europe. · They are propeller blade shaped freshwater mussels that can easily attach themselves to objects and other organisms, and they are difficult to remove. · Adult mussels will attach themselves to boat hulls, trailers, motors, vegetation and equipment. · Where introduced, these mussels kill native mussels and clams, and reduce native fish species, by altering the aquatic food web. They also attach to aquatic plants and submerged surfaces, including piers, pilings, water intakes and fish screens. · If large numbers of mussels become established in an area, they can cover hard surfaces and clog pipes. · To report suspected invasive mussels, please call the Report All Poachers and Polluters line (RAPP), at 1 877 952-7277. · Columbia Basin Trust entered into a three year partnership with the four invasive species councils (councils) in the Basin last year. The councils have recently completed the development of a co-ordinated Basin-wide strategy for addressing priority aquatic invasive species, including mussels. · The councils will provide their valuable time and equipment toward this initiative. · Columbia Basin Trust supports the ideas and efforts of the people in the Columbia Basin. The Trust offers a range of services, programs, initiatives and financial investments for the social, economic and environmental well-being of the Columbia Basin now and for generations to come. · Columbia Power develops, owns and operates hydro power projects in the Columbia Basin. · FortisBC is a regulated utility focused on providing safe and reliable energy, including natural gas, electricity and propane. FortisBC employs more than 2,200 British Columbians and serves approximately 1.1 million customers in 135 B.C. communities. To learn more about Columbia Basin Trust, visit: http://www.cbt.org/. For more information about Columbia Power, visit: www.columbiapower.org. For more information about FortisBC, visit: www.fortisbc.com.